Have you ever wished you could start your journey into herbalism, but felt you didn’t have the time, resources, or opportunity? Our affordable and convenient self-paced online program gives students with little or no herbal experience a glimpse into the world of herbs, kindling an enthusiasm for a lifelong path of learning. 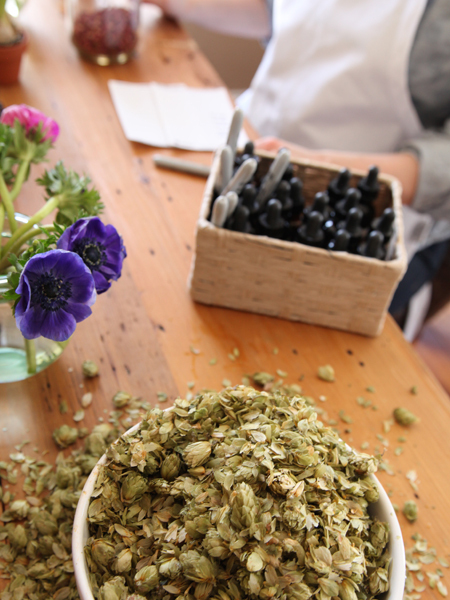 By the end of the Introductory Herbal Course, you will understand the ways in which the herbal approach can support radiant wellness, and you will feel more comfortable AND excited about making and using your own teas, tinctures, and body care products. 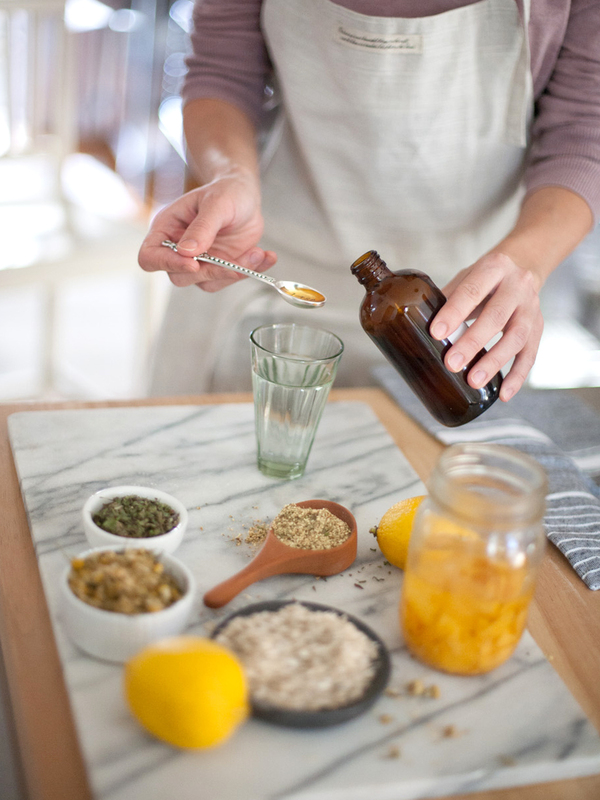 Get ready to mix up new recipes in the kitchen, use spices and herbs you never knew had wellness-promoting properties, and walk away inspired to pursue your herbal studies at the intermediate level and beyond! Choose to upgrade your enrollment with our Print Version, a complete set of textbooks presenting the entire Introductory Herbal Course in printed form – over 730 beautiful pages at your fingertips! ** Introductory Herbal Course Textbooks are sold out at this time, however the online course version is still available and actively enrolling new students. Choose the online version below to register! Herbalism offers a window into a world that values and celebrates our connection with plants. If you are reading this, there is something in you yearning to rediscover this relationship — and you are likely looking for someone to guide you on this path of discovery. We are delighted to walk beside you while you begin your herbal journey, and to support you in getting the most out of your experience! Perhaps you found your way here because you’ve been wondering about all those beautiful green weeds growing along roads and in your backyard. Ancient wisdom and natural beauty have been tugging at your heart and you’re naturally curious about how you can integrate these plants into your life. You don’t feel like you need someone pushing you to learn, because you believe the knowledge you gain is its own reward. You just seek guidance on how you can directly apply that knowledge to help you become your healthiest and happiest self. 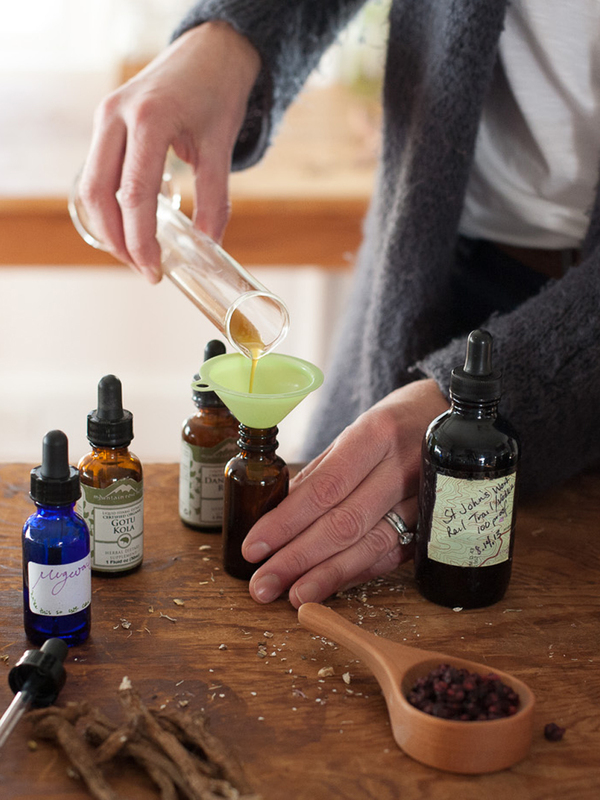 Our intention for this self-paced herbal course is to give those of you new to herbalism a taste of a holistic approach to wellness and vitality supported by herbs. This introductory level class will teach you how to integrate herbs into your daily life and how to make herbal preparations and body care products for daily care and common ailments. You’ll learn the properties of familiar herbs and spices (as well as those not yet familiar to you) and explore their wellness-supporting uses. The engaging lessons, beautiful presentation, and sound knowledge will delight the learner in you and instill an appreciation for the gifts herbalism has to offer, inspiring your future studies as well. We’ll be covering a broad spectrum of topics from using herbs in the kitchen and making herbal preparations to herbs for common body system imbalances and the herbal holistic approach! Roll up your sleeves because we’re about to get very hands-on! We’ll be covering 34 lessons in this course, teaching you the foundational principles you need to know to get started as an herbalist. Downloadable and printable, every unit includes an assortment of useful charts and handouts! 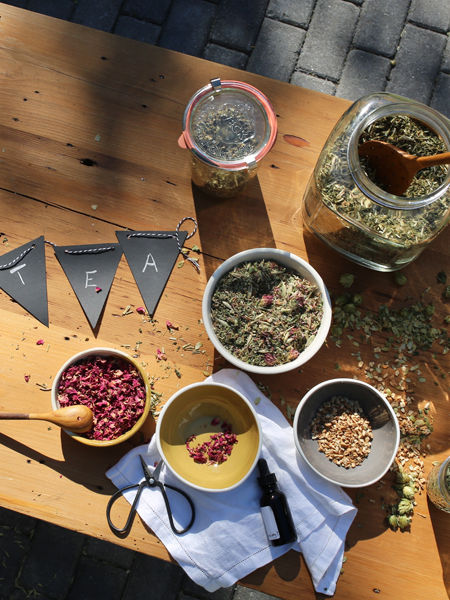 We have compiled an inspiring assortment of herbal tea recipes in The Tea Booklet ready for you to download and print for your continued use – over and over again! This Ebook is also one of the books included in the course’s Print Package upgrade! Roll up your sleeves! Each unit includes dozens of recipes and preparations to help you get started making teas, tinctures, syrups, and body care products! You can download and print recipes individually, and all course recipes are also compiled in one downloadable PDF organized by unit for easy reference. Learn your herbs! Students will have access to over 75 herbal monographs for in-depth study. Each monograph includes information on herbal actions, uses, energetics, safety, and dosage. Monographs are presented within the course lessons, and also compiled in alphabetical order in a downloadable PDF for easy reference and printing. The course includes dozens of educational video demonstrations to provide a multimedia learning experience and enrich your engagement with course topics. Video transcripts are provided for each video in downloadable PDF format. Each unit includes exercises designed to help you delve deeper into course topics, and requires successful completion of a quiz in order to pass through to the next set of lessons. Retake the quizzes as many times as needed! Graduates receive their own certificate upon completion after successfully passing every quiz in class. We’re with you all along the way! Students have access to course instructors and Herbal Academy team members throughout the program. Herbal Academy students and graduates get access to our thriving private MyHerbalStudies Facebook community! Grow with your fellow classmates as you journey through your studies, ask questions of your teachers, and share your experiences with this inspiring community! Access to the Herbal Academy’s catalog of discounts, including Mountain Rose Herbs and Bulk Herb Store orders, $20 off United Plant Savers membership, 25% off Natural Herbal Living subscriptions and herb boxes, and savings on Essential Herbal Magazine, Mother Earth Living, Original Organics, and more. Upgrade your registration with our Printed Course Package to experience your course to the fullest! The set of books presents the entire Introductory Herbal Course in printed form – over 730 pages at your fingertips! You will receive the Herbal Academy’s complete Introductory Herbal Course textbook in a beautiful and convenient printed version – over 550 pages! The set also includes a companion Recipes + Monographs Book with over 140 pages, thoughtfully organized into a treasured resource. This book includes all of the monographs and recipes from the course compiled for ease of use as a go-to reference. The third book in this set is The Tea Booklet! Take your recipes into the kitchen with this inspiring assortment of herbal tea recipes available in one convenient book for easy reference and ongoing use! View more images of the Introductory Herbal Course’s Printed Textbook Package here. In this beginner’s herbalism course, you will learn about the herbal approach, why herbs are important, and how to use them in teas, infusions, decoctions, tinctures, syrups, topical applications, and body care products. We’ll discuss internal and external application of these preparations, herbal actions and energetics, safety information, and dosing. The Introductory Herbal Course covers various body systems, including the immune system and the respiratory system, and discusses herbal support for maintaining balance in these systems as well as for addressing common complaints such as colds and the flu, bronchitis, and allergies. You’ll find discussions on herbs for children and reproductive health. Because stress is such a prevalent factor in our overall wellbeing, we’ll talk a bit about the nervous system, why a calm, strong nervous system can lay the foundation for better health, and provide herbs and lifestyle habits to support good sleep and ease headaches. We delve into body care and skin as well as healthy aging lifestyle approaches. Finally, we finish up with the holistic approach—what it is and how it differs from the conventional medical approach—and how to put it into practice. While we recommend spending at least 1 month of serious study in each unit, students have the ability to work at their own pace toward completion of the course and can spend more or less time in each unit. Students will have access to the online portion of the program for 12 months. Each of the units and lessons, recipes, charts, video transcripts, and ebooks are available to download and print so students can continue to use these resources even after completion of the course. I thank you for all your hard work in pulling it together – that you know, and care about, what you teach is very evident in the course materials. Nicely done! Just want to say how much I am enjoying your herbalist course online and to tell you that your heart, sensitivity and good will come through in everything you are producing. I am very impressed and feel blessed to be a party to your social and educational world. I am LOVING the Intro class! The content is easy to understand and I can’t wait to start the Intermediate class! I just wanted to share my gratitude for being a part of this online education program! I feel like I have an excellent start to understanding the world of herbs. Your language was easy to understand and flowed nicely. Wonderful lessons, well paced, and very detailed. I think this is a beautiful, professionally done, and very well laid out course that everyone should do! Although I’m already a somewhat experienced herbalist, this course has really exceeded my expectations! I feel more empowered and less hesitant about playing with plants. Really enjoyed the intro and herbal basics!!! Super info dense while remaining understandable, clear and not at all overwhelming. Really amped me up for the rest of the course!! I have recently signed up for the Introductory Herbal Course. So far it is amazing! There is so much to learn! Every little bit of information found in this course is making me want to know more! I just wanted to express my gratitude to you for creating such an informative, organized, and beautiful herbalism program. Your Introductory Course was one of my first real open doors into the world of Herbalism, and I found it to be a clear and concise glimpse into the beautiful experience that we may have with the natural world. I am currently a student of Massage Therapy, so the holistic health field is a strong passion of mine. I also work in a plant nursery, and my “happy place” just so happens to be the outdoors. This course was a great way for me to combine my whole world into one great format. I am inspired to keep learning and growing. Perhaps someday I will have enough knowledge and experience to have a strong role in the promising and vibrant world of herbalism. Thank you for being a part of my journey! We’ve designed our online programs for an international audience, so no matter where you call home, this course will be relevant! We keep our enrollment open which means new students are joining us each and every day. So when you are ready to begin your studies, you’ll be registering with a group of students working through the same lessons you are.